Skylight Prices - How Much Does it Cost To Buy, Install or Replace a Skylight? skylights specialist with the best service, professional advice and product range. No 1 Roofing & Building Supplies are the premier supplier and stockist of VELUX, Skyspan, Skydome & Regent skylights. 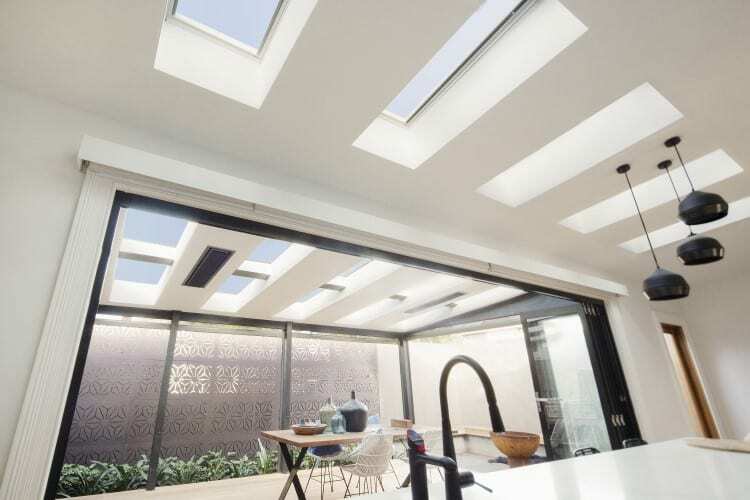 World-beating technology and outstanding quality—that’s what makes a skylight the perfect natural lighting and ventilation choice for Australian homes. We have skylights, roof windows, and sun tunnels available for pitched roofs and flat roofs. Solar powered opening skylights are ideal for those out of reach roofs or you can go for a manually opening roof window for that attic conversion; choose from centre pivot opening or dual action opening. 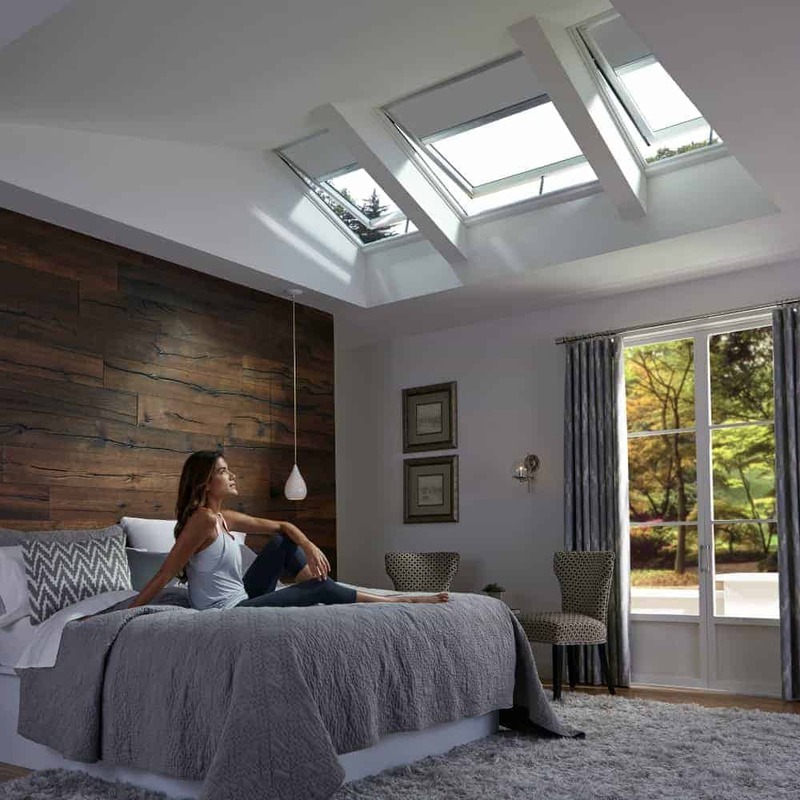 Skylights not only let the light in but they also add significant ventilation for dark bathrooms, kitchens, or passageways, and adding space to loft bedrooms and attic conversions. We supply the full range of Velux skylights for residential and industrial purposes. 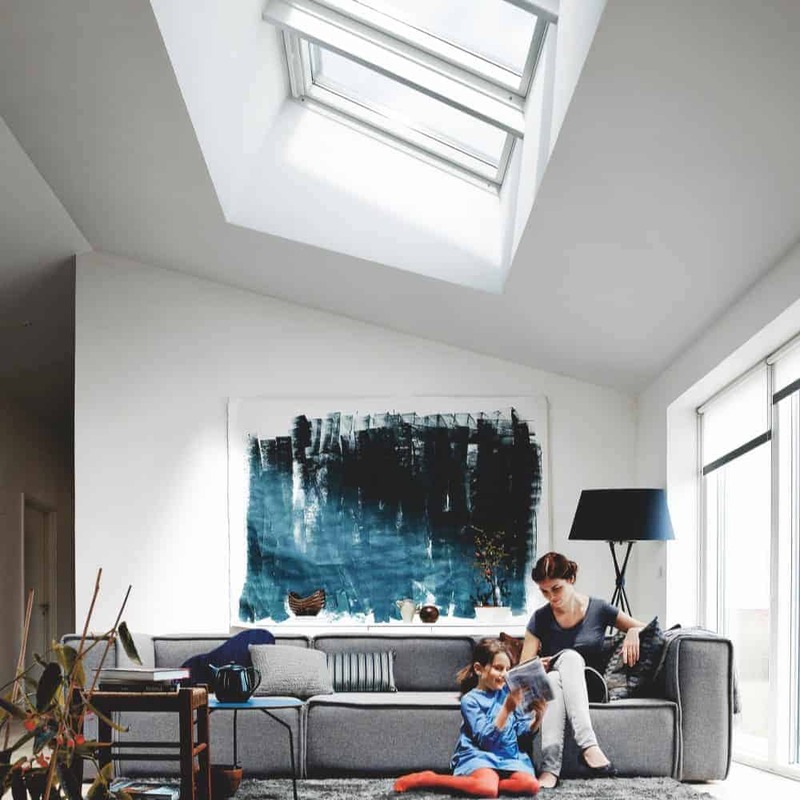 The expansive Velux range opens up a whole new world of exciting ways you can make home lighter and more welcoming as well as adding value to your property. After all, Velux have been letting the light into homes around the world for 75 years. We’ve put together this useful skylight prices guide to help you choose the ideal skylight for your needs and budget. Although the guide focuses on Velux it will also give you some great ideas about other amazing options that are so easy to install. We also stock a wide range of blinds, winder handles, and flashings to complement your new skylight. Prices for Velux skylights range from $263 for a fixed comfort double-glazed skylight right through to a massive 1275mm x 1275 mm solar powered skylight for a flat roof at $4646. All Velux skylights and windows are bushfire rated to BAL40 (rigid Sun tunnels meet BAL29 standards). 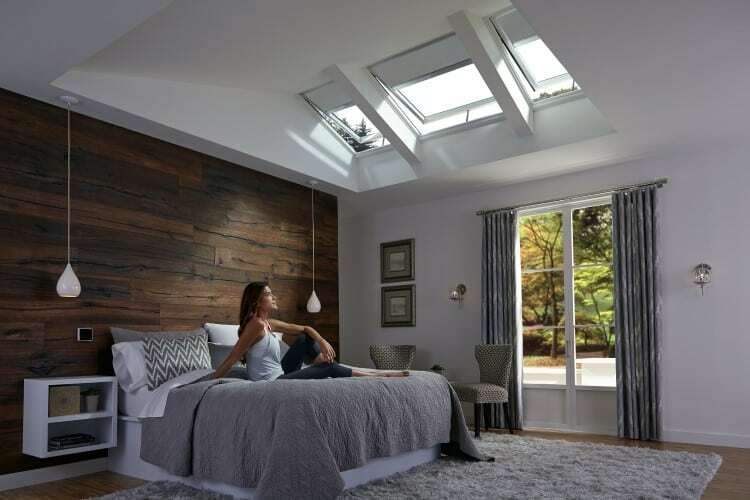 Read on for more details on pricing across the range of Velux skylights. Pricing for other brands is available on application. LIKE A QUOTE FOR YOUR SKYLIGHT? 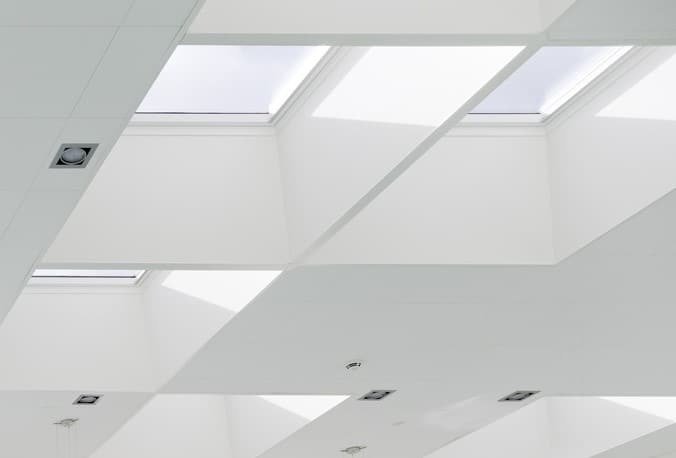 The first thing you might need to ask when pricing your new skylight is will it be replacing an existing skylight or will it be an entirely new installation? If you are simply replacing an existing skylight the overall price may be much lower because you will not need to frame the roof opening. However, you may run into additional installation costs if the existing skylight was not installed properly, water leaks have damaged the framing, or the existing skylight is an unusual size. Other aspects such as the type of roof (tile/metal roof), roof pitch, style preference (e.g. clear / opal / openable etc. 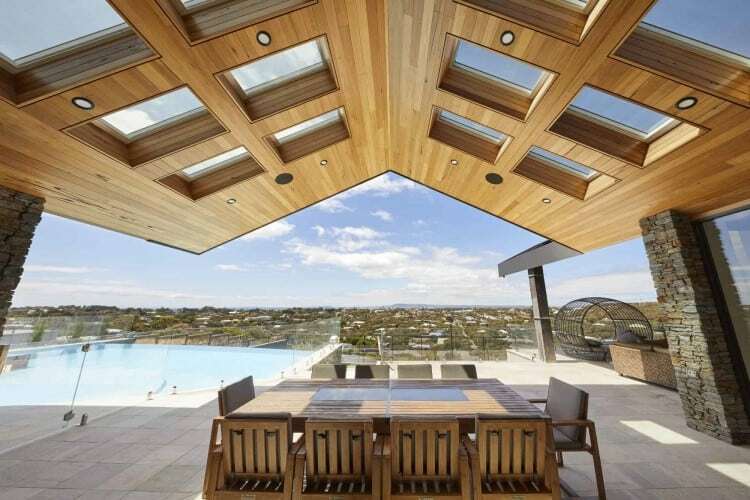 ), as well as the reason for the skylight may also limit your options or increase the price. You will also need to factor in things like installation of electrical cabling if applicable. All these factors may apply whether you are replacing an existing skylight or installing a new one. If you are installing a new skylight you need to ensure there is adequate space for any additional framing needed to support the skylight. 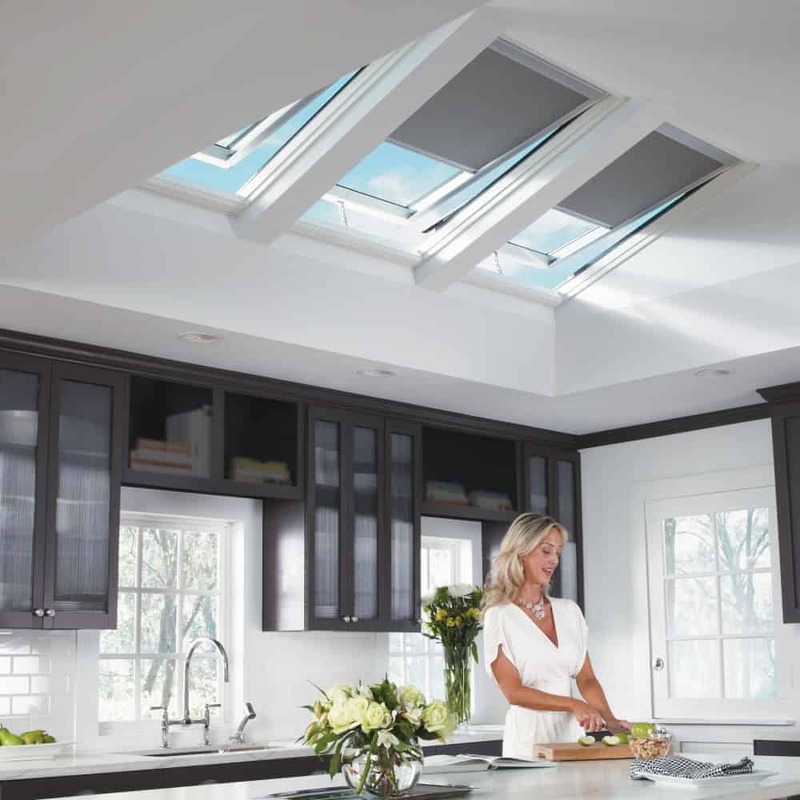 Velux Skylights can be opened manually or by solar power or fixed (non-opening). These three options are available for pitched or flat roofs. You can install solar powered skylights on roof pitches up to 60° and manually opening skylights and fixed or non-opening skylights on roofs from 0° to 90°. The solar powered skylights attain sufficient charge during the day to operate 24/7 and remote control allows you to set and forget. The rain sensor will automatically close the window in the event of rain. They do not require an electrician to install. These are also available in a hard-wired electrical version (requires an electrician and wiring). Fixed non-opening skylights are the perfect replacement for old cracked or damaged acrylic domes. Roof windows are ideal for bringing light and ventilation to attic conversions and loft bedrooms where you can easily reach the window. Choose from centre pivot opening or dual action window (can open from the top or the side). Centre pivot windows are suited to roofs from 15° to 90°, dual action up to 55°. The interior of all Velux windows features a beautiful white painted pine sash and frame. Velux windows feature an innovative 180° reversible design to facilitate easy cleaning. Manual and solar powered blinds fit Velux skylight and window models. Blockout blinds reduce light by 100% and heat by 40% while Honeycomb blinds reduce light by up to 95% and heat by 60%. The simple click installation is just so easy. Sun tunnels are ideal for bringing light into dark, awkward spaces such corridors, stairwells, and bathrooms. They need to be installed on pitched roofs and you have a choice of rigid tunnel or a flexible tunnel (for those areas where obstructions in the roof cavity block the way). You can choose from two types of double-glazing; High performance or Comfort. High performance features laminated inner panes and toughened safety glass on the outer. The argon filled cavity and Low-E³ coating provides optimal thermal efficiency and light transmission. High performance glazing blocks 99% of harmful UV radiation and 75% of radiant heat. High performance glazing is a building code requirement for skylights installed more than 3 metres above the ground. Comfort double-glazing features toughened safety glass, an argon filled cavity and Low-E³ coating. Comfort glazing blocks 95% of harmful UV radiation and 75% of radiant heat. Comfort glazing is generally between $50 and $100 cheaper than the High performance range. Removable insect screens are available for all opening skylights and windows. We also supply the full range of Velux control rods, winder handles, and remote control panels. 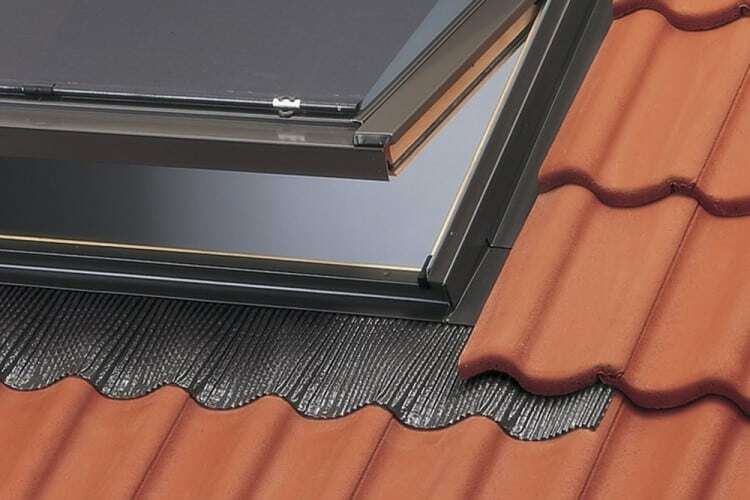 Velux skylights, windows, and sun tunnels are suitable for metal and tile roofs and the 2019 prices generally include the appropriate flashings. We recommend custom flashings for metal roofs where the profile is other than corrugated. All Velux skylights, windows, sun tunnels and flashings are guaranteed for 10 years. Blinds, controlling rods, and handles are covered for 3 years. ^Wireless wall-mounted keypad supplied. NB: Blinds are not available for FCM Skylights. Packages complete with integrated flashing for tiled or corrugated iron roofs (not suitable metal profiles such as Klip-Lok, Trimdek), tunnel and ceiling diffuser. Sun Tunnels are not suitable for roof pitches below 15°. Good quality skylights can significantly reduce the lighting and power bills in any large commercial premises. The increased natural ventilation is also a winner in most commercial settings. We sell all major brands and a complete price list is available on application. 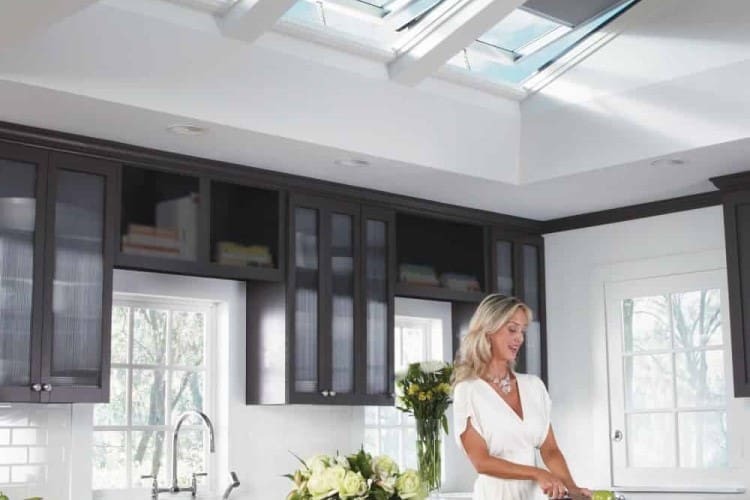 Most skylight pricings (but not all) will include flashings but here are some things to think about when you’re planning for your new skylight. Talk to us to get an accurate price for all your flashing requirements. 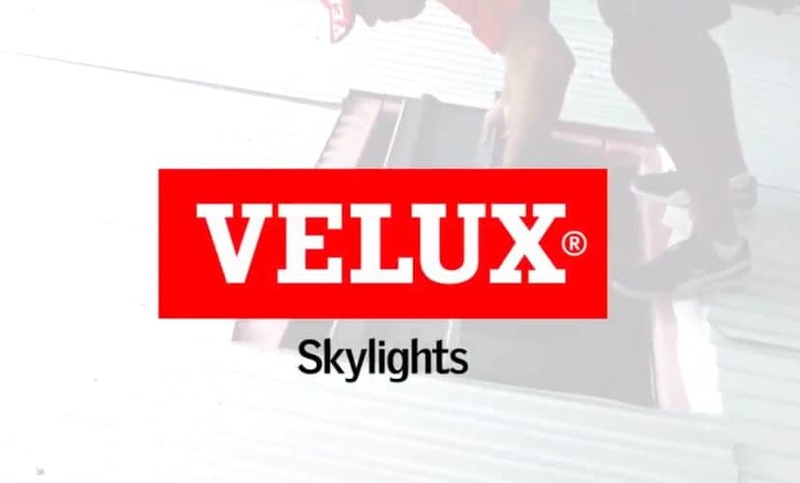 Skylight companies such as Velux have spent many years refining their products and simplifying the installation process. We offer two options that give you more control over your budget. Supply only– pick up from our network of locations or have it delivered (delivery fee extra) to your nominated address. Supply and install– contact us and one of our accredited and licensed installers will provide you with a quote. Your new skylight will bring light and a breath of fresh air to your home as well as add value to your property. Here at No.1 Roofing and Building Supplies we’ll make sure that the quality of the work and your satisfaction in the end result will keep you smiling for years to come.